I told you Dear Readers I was going to see STAN & OLLIE when it came to my area, and last Saturday night I did just that. Taking the 22 mile trip down the highway to Swansea, MA to catch the 9:40 showing, I have good news and bad news. 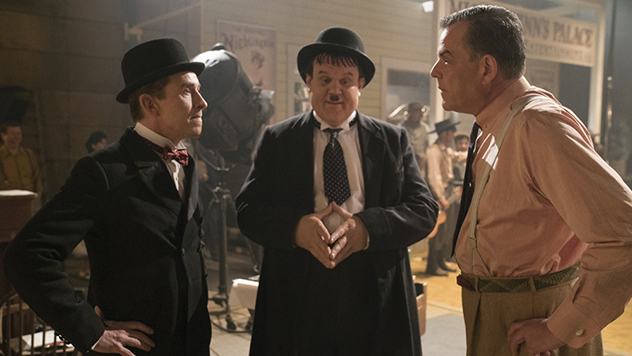 The good: STAN & OLLIE is one of the best Hollywood biopic I’ve ever seen, a loving tribute to the classic comedy duo. The bad: well, I’ll get to that a bit later. The film follows Laurel and Hardy as they embark on a 1953 tour of the UK. The duo is older, in need of money, and Stan is working on obtaining funding for their screen comeback – an adaptation of the Robin Hood legend. Ollie is in poor physical condition due to his massive weight gain, but Stan has persuaded him to do the tour. They’re booked into a succession of second-rate houses, with a rather sparse turnout but the veteran troupers press on, adding some funny new gags to their repertoire. The new film falls through, as the producer’s unable to secure funding for a Laurel & Hardy movie, but Stan continues to work up new gags for it, stringing Ollie along to keep his spirits up. The team’s wives come abroad to join them, Ollie’s devoted Lucille and Stan’s Ina, though the women aren’t really fond of each other. Things get ugly at a party in their honor, when Stan’s old resentment over Ollie making a film without him (1939’s ZENOBIA) while Stan was involved in a contract dispute with Hal Roach rears its ugly head, and harsh words are exchanged. The two stop talking to each other… until Ollie suffers a heart attack while they’re judging a bathing beauty contest. The old friends mend fences in a touching scene, but doctors insist Ollie retire from show biz immediately. Stan is forced to try and continue the tour with a new, untried partner, but can’t bring himself to do it. Stan and Ina pack and get ready to return stateside, when a knock on the door finds Ollie, dressed and ready to return to the stage, despite his illness. It’s a chore, but he makes it through, and as they depart for the Irish leg of the tour, Stan lets Ollie know the new film isn’t going to happen. Ollie says he already knew, but let Stan believe he didn’t, because the show must go on! 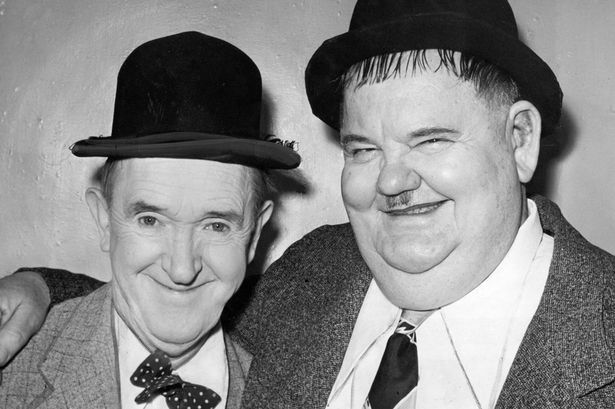 Some dramatic license has been taken in STAN & OLLIE in order to give the film some conflict. As I told you in last week’s post on WAY OUT WEST, that 1937 comedy serves as the jumping off point for the new biopic. Stan argues with producer Hal Roach on the set, demanding more money and ownership of the Laurel & Hardy films. Didn’t happen. 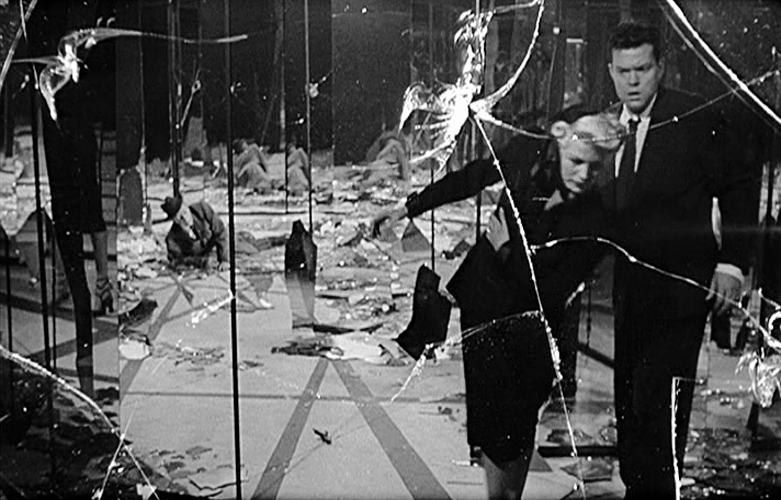 Stan was too much of a professional to cause a scene on a film set, though he did leave Roach during a contract dispute. Since Ollie was under a separate contract, Roach cast him in ZENOBIA opposite former silent star Harry Langdon. There was no animosity because of this, and no later public spat, but hey – can’t have a film without a little conflict, now can we! Ollie was certainly ill, and did indeed suffer a heart attack on tour, but Stan wasn’t in the best of health either, having troubles with both his prostate and diabetes. There was indeed a ‘Robin Hood’ movie in the planning stages, but it was back in 1947. 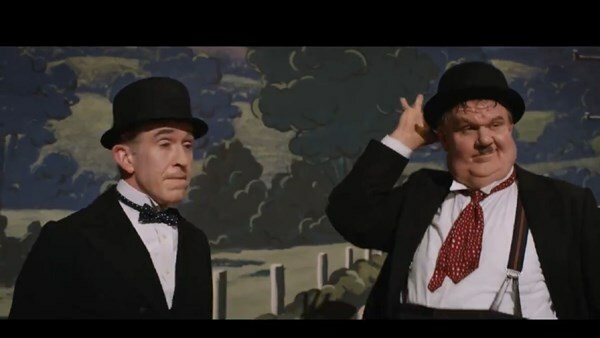 Be that as it may, STAN & OLLIE works mainly because of stars Steve Coogan as Stan Laurel and John C. Reilly as Oliver Hardy. 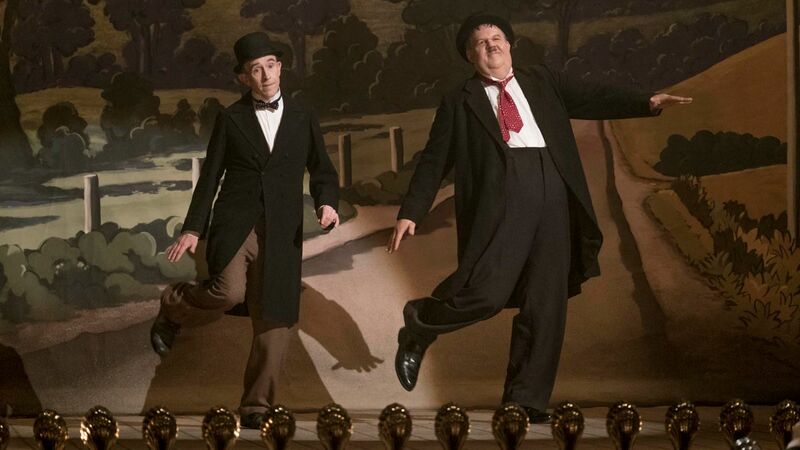 These two actors are pitch perfect as the duo, recreating many classic scenes and gags, and while Reilly has been singled out for his performance (deservedly so), let’s not give short shrift to Coogan as Stan Laurel. They are a delight, and both men are entitled to a large round of applause for bringing Stan and Ollie back to vivid life. 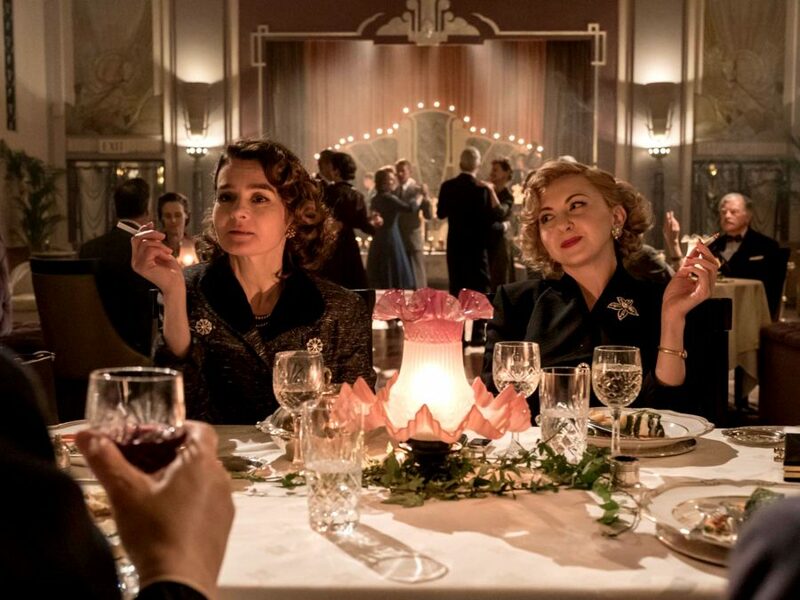 Equally good are Nina Arianda as Lucille and Shirley Henderson as Ina; the two women act as almost a second comedy team! Rufus Jones does good work as real-life tour promoter Bernard Delfont (he was the real-life brother of famed producer Sir Lew Grade), Danny Huston shines in his brief turn as Hal Roach, and film buffs will enjoy cameos by Keith MacPherson as L&H’s perennial screen nemesis James Finlayson and Richard Cant as Harry Langdon. Jeff Pope’s screenplay has called a “love letter” and “valentine” to Laurel & Hardy, and those are pretty apt descriptions. Though that necessary conflict arises, Pope shows how the boy’s undying affection and friendship for each other conquers all, as when Stan climbs into Ollie’s sick-bed to help keep him warm. I particularly enjoyed a small, wistful moment when Stan, walking the streets of London, looks up at a movie poster of ABBOTT & COSTELLO GO TO MARS, knowing he and Ollie will never get back to the big screen again. John S. Baird’s direction is subtle and unobtrusive, the hallmark of a good storyteller. STAN & OLLIE is not only for fans of Laurel & Hardy in particular, or classic films in general, but for fans of good, heartfelt filmmaking. And now for the bad news (besides the film not getting any Oscar nominations! 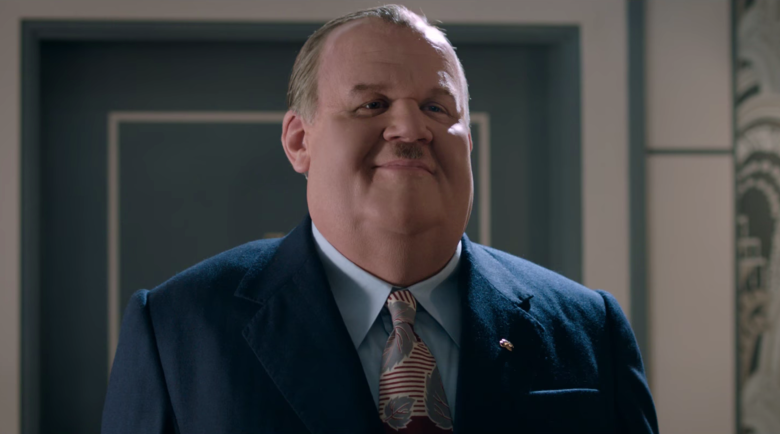 ): while the multiplex had large crowds for AQUAMAN, GLASS, MARY POPPINS RETURNS, SERENITY, and VICE, the showing of STAN & OLLIE I attended played to an audience of one – namely Yours Truly. I didn’t expect a huge turnout, but neither did I expect I’d be getting a private screening! 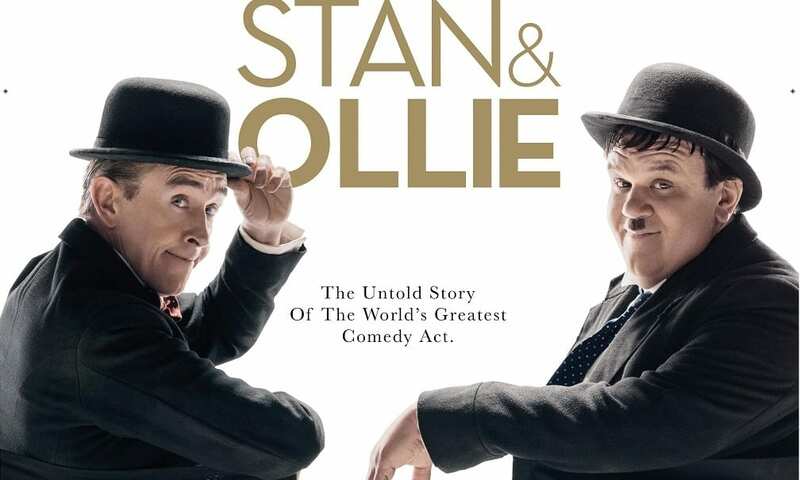 I felt a twinge of sadness about this (okay, more than just a twinge),as STAN & OLLIE is a good film about two great comic talents and deserves to be seen, preferably on the big screen. So if it’s playing at your local theater, do me a favor… go out and support the film. As a lifelong Laurel & Hardy fan, I promise you won’t be disappointed. Stan and Ollie deserve it. Wow. An audience of one. That is disappointing. I found the film incredibly sweet and moving. And very welcome as a story meant for adults to see (as you say above). Perhaps we’re also seeing something of a renaissance of stories that present friendship between men (IF BEALE STREET. . .). Since you seem to be quite a fan, do you have a book about them that you can recommend? I found a few, but if I’m going to read just one, I’d like it to be the best one out there. If you can find a copy of John McCabe’s long-out-of-print “”Mr Laurel and Mr Hardy” on Amazon, snap it up! Found it and ordered it. Thanks! I will definitely see this. When I was a kid, I loved watching their old films on Saturday afternoons when my local PBS station would run classic movies. Oh and now I’m feeling just a little bit emotional! Ah! So psyched and excited to see this. It looks and they look perfect. Oh no! You were the only person in the theatre? That is so sad! Do see it when it hits your neck of the woods, it’s well worth it.